This is a beautiful, light and spacious home situated in an ideal spot for a family vacation in Florida. We are close to all the Disney Parks, Seaworld and Universal and just an hour from Cape Canaveral and Cocoa Beach. With cathedral ceilings and a host of upgrades this home, built in November 2006, is furnished to a very high standard. We have a south facing pool and sun deck to maximize your enjoyment of the sunshine state all year round. This four bedroom, 3 bathroom villa features two master suite bedrooms, both containing a queen sized bed and bathroom inside each suite. The 3rd bedroom has a queen sized bed and the 4th bedroom has two twin beds and a bathroom next door. The spacious living room with its high cathedral ceilings is beautifully furnished to the highest standard, it has a Large TV, INTERNET and DVD for your evening entertainment. The Kitchen is fully equipped with stove, dishwasher, fridge freezer, microwave, pots and pans, enabling you to prepare and cook gourmet meals or just quick snacks. There is a formal dining area for displaying and enjoying your culinary delights where you can sit and relax over your meal and a breakfast nook for your morning coffee, use the lanai where you can supervise the children in the pool. All bedrooms have their own bed linen and towels are provided for your use. We have a laundry area with washing machine,dryer, ironing board and iron. 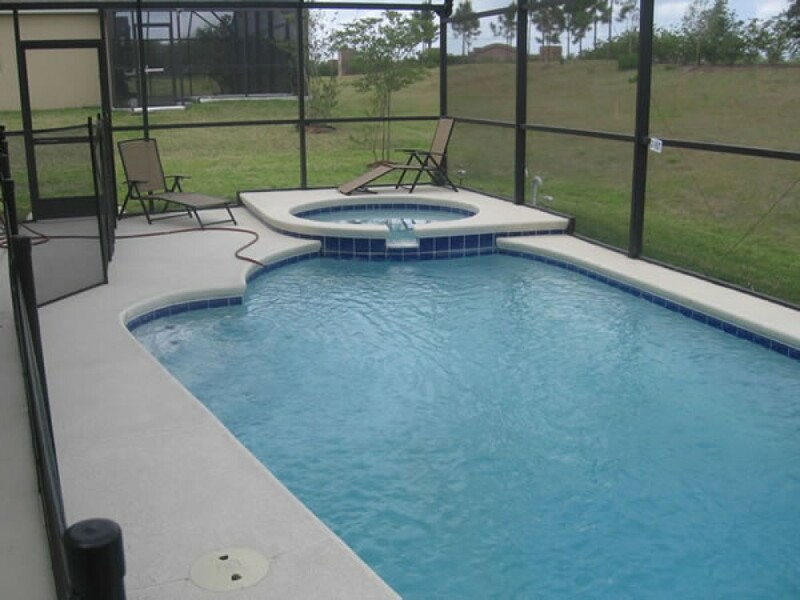 The larger than average pool area is fully screened to allow in all the Florida sunshine in while keeping out flies or bugs. The pool has a safety fence which can be placed around it if you have children in your party. The garage has been converted into a game room with and table tennis and a dart board. We have wireless internet, cable and free local telephone.